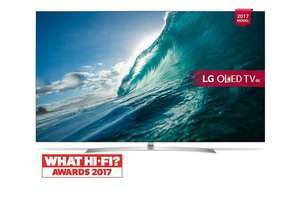 Richer Sounds have refurbished stock of the LG OLED55B7V in their online clearance section for £1079. Apply the code VIP10 at checkout and this reduces the price by a further 10% down to £971.10. 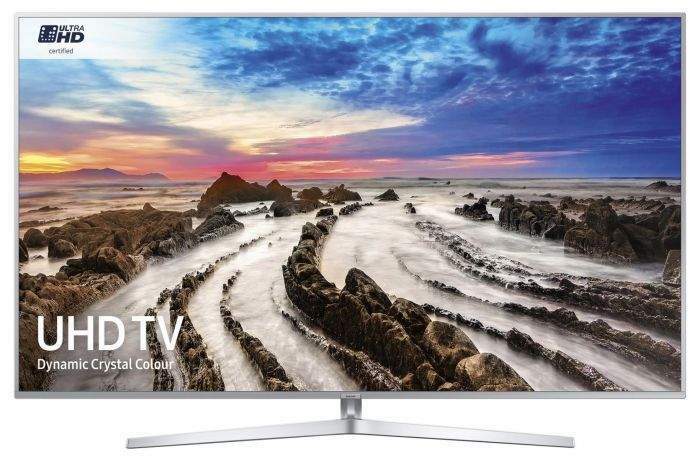 If like me you've been on the fence over the recent price drops of these tempting OLED TVs, this might tip you over the edge! 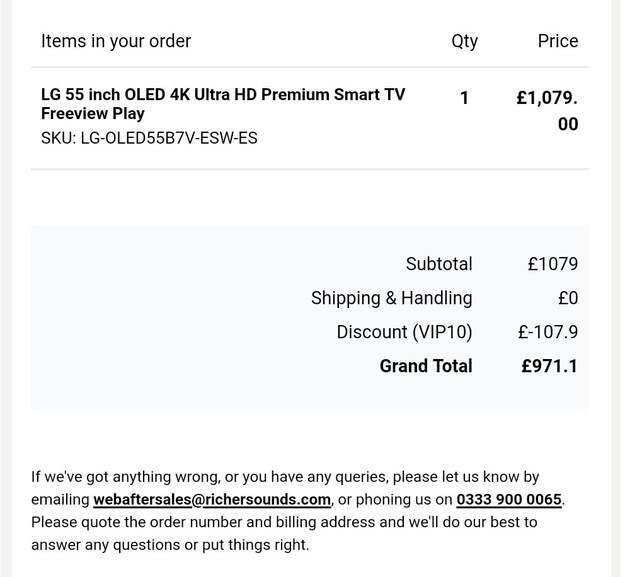 Number of people on here that have said they will only bite at under …Number of people on here that have said they will only bite at under £1000. Time to see if they're all talk and no trousers. I really wouldn't buy a refurbished OLED. You have no idea how they have been treated. Save up for another few weeks and pay the extra couple of hundred for a brand new one. Should state refurbished in title OP. I really wouldn't buy a refurbished OLED. You have no idea how they have …I really wouldn't buy a refurbished OLED. You have no idea how they have been treated. Save up for another few weeks and pay the extra couple of hundred for a brand new one. Wait a few weeks? PPPFFFFTTTTTTTT. Sell a kidney and get new now! Number of people on here that have said they will only bite at under £1000. Time to see if they're all talk and no trousers. What’s the going rate for a kidney? Agreed there, but they will be waiting at least another year before new gets to this price. Agreed there, but they will be waiting at least another year before new …Agreed there, but they will be waiting at least another year before new gets to this price. I'd bet they would sell out of B7 stock before it gets to below £1K. That's what happened with the 6-range. I'd bet they would sell out of B7 stock before it gets to below £1K. …I'd bet they would sell out of B7 stock before it gets to below £1K. That's what happened with the 6-range. Agree. Hence I bought new at 1149 last week via price beat. For a good current deal potentially at 1179 see my post for one. My LG has broken down twice and it’s barely 2 years old. It’s on the blink again and off to repairer under warranty again. You need a five year warranty on modern tellies esp if you’re spending a grand or more. Wouldn’t pay that for a refurb, who knows how old it is or how much use it has had. Clearly the seller has little confindence in it as only a 12 month warranty. I have bought JL floor model tv and have the same 5 year warranty. Oooh I want one! Sadly my 50” Samsung Plasma (that I picked up for £350ish in the very first proper Black Friday deals in 2011 when everybody here got cross about how few of each deal item there were) is still going strong. I’ve met & married my wife in that time & had 2 kids. And STILL the TV hasn’t died. And it’s the Wife who won’t let me drop £1000 on a new one when the old one works perfectly. I should add this is hot. Prob wouldn’t buy the referb myself mind. Prefer new. A refurb at that price? Crazy. 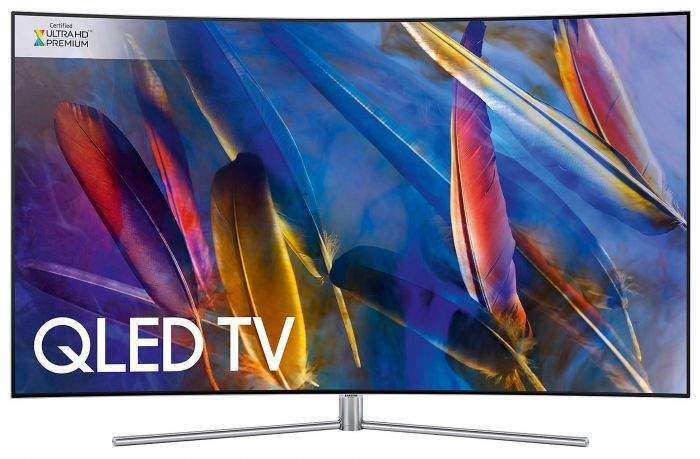 These OLED's will be new for less towards the end of the year which is probably the best time to buy TV's anyway. And it’s the Wife who won’t let me drop £1000 on a new one when the old one …And it’s the Wife who won’t let me drop £1000 on a new one when the old one works perfectly. Are you still talking about the TV or the wife? Sorry stave, couldn't resist; just the way you wrote your comment. I used to repair TVs for a few years, I’ll say 90% of refurbs are returns, very few are actual repairs. However during a World Cup year, we received a massive inflood when England was knocked out. The turn around time on them would have been a couple months.... so it makes sense to see a lot of refurbs on sale now. Deal posting newbie! This is josh.bolton first deal post. Help out by leaving a posting tip or just to show your appreciation for their contribution.